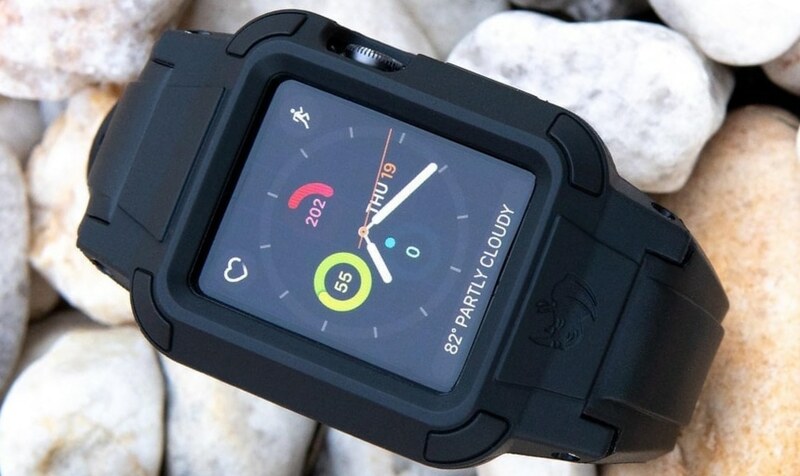 Rhino Band Review: Is This Tank Your Apple Watch's New Best Friend? Disclosure: This is a sponsored post. We received compensation and courtesy product from Rhino Band in exchange for our honest review only. All opinions expressed here are our own. By Dean Stephens Last updated Dec 3, 2018 We may get a commission for purchases made via our links. Here's why. Rhino Band’s protective bands provide tank-like protection for your Apple Watch with a tank-like aesthetic. They impressed me where it matters with their high quality of materials, comfort, and above all else, durability. Innovative. Aesthetically pleasing. Satisfying to operate. Constantly at risk of scratching or breaking with even the most minor of knock. Especially straight out of the box. 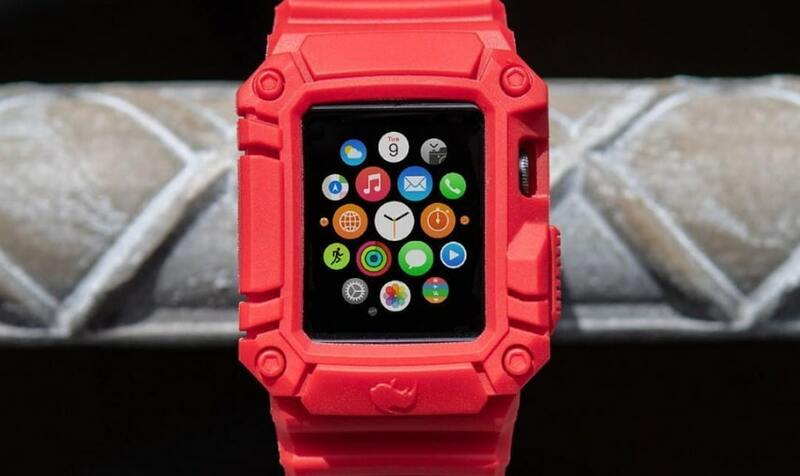 The Apple Watch is no exception. Gloriously functional, it has an almost toy-like appeal that has contributed to its explosive popularity. And while you’re less likely to drop one like you are a phone, it’s still a wrist-watch. Which means it’s exposed to the elements at all times and susceptible to bumps and knocks. And hey, you’re probably fine if you’re only wearing your Apple Watch to your cozy office job (but watch out for those printers, they can really come at you out of nowhere). But what about your active life? The sports, the camping, the long sessions at the gym? Coincidentally, it’s when you’re exercising, getting outdoors, or working, that you crave your Apple Watch’s functionality the most. And if you have a physical or outdoor job, wearing your expensive wrist-candy may rightfully seem like too much of a risk. Personally, I’ve been treating mine like a nice pair of leather shoes. No way would I ever wear it out in the rain. I also like rock climbing, but I’ve never been game to wear it for obvious reasons. This led me to Google. Which led me to Rhino Band. I liked what I was reading and so I reached out their team to see if they’d be interested in letting me put their bands to the test. The team sent across both a Stealth model in black (42mm) and a Runner in red for me to put to my own rugged scrutiny. On first impression, they’re not exactly the most elegant in appearance. They have a unique tough, utilitarian appeal. But it does grow on you. While the comparatively dainty leather strap I’d been previously using could compare to a Porsche, The Rhino Band is most definitely a Hummer. Scratch that. It’s a tank. How difficult is it to install the bands? Does Rhino Band sell any other products? What’s Rhino Band’s return policy? 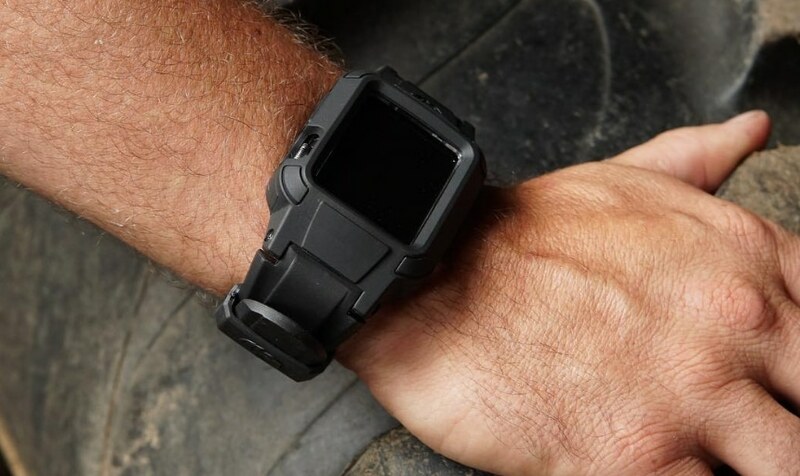 Does Rhino Band have any future products in the works? Do the bands function for both left-handers and right-handers? Can I charge my Apple Watch without pulling apart the band? Is Rhino Band For You? 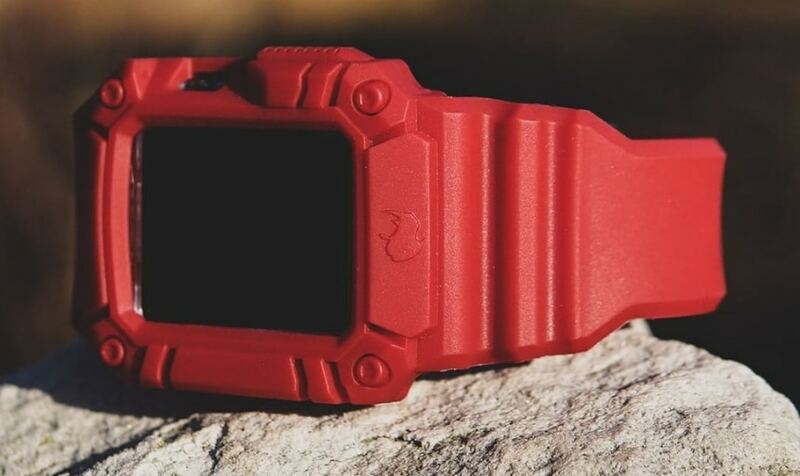 Rhino Band is a company that designs and creates stylish protective technology for the Apple Watch. Like most accessory oriented companies, Rhino Band was born out of a need. Two friends, each successful in engineering and product design, were struggling to find protective accessories for their tech that could keep up with their rugged and active lifestyles. So, they created their own company to solve that very problem. One thing I’d like to highlight is that Rhino Band offers special discounts for first responders and the military. I like that, it’s a nice touch. I have a biased approach toward all technology accessories I try. It’s basically “crap until proven useful”. Similar to a mid-tier poly band product like Nixon or G-Shock there was a good amount of weight and hand feel to the Stealth and it held really comfortably to my wrist when fastened. I find that a lot of protective bands tend to forgo both aesthetics and comfort for increased durability, but this is up there with one of the most comfortable protective bands I’ve tried. I placed my 42mm Apple Watch inside of the band and the installation instructions were really easy to follow. Once installed, it locked into the case nicely and I still haven’t noticed any evidence of movement or rattling of the watch when wearing it and moving my wrist around. So what about using the thing? Day to day use of the Stealth Rhino Band has also been a seamless experience. I really like that it doesn’t interfere with my experience of using my Apple Watch. The crown and touch function are easy to access and remain responsive. From a style perspective, the Stealth’s ‘in-betweener’ design means that while it’s not as rugged looking as the Runner (reviewed below), it still doesn’t really lend itself to casual or office wear. You’ll probably want to stick to your stock strap or another more fashionable strap. My skin gets fairly fussy with anything that may cause a rash or friction. I’ve definitely felt the wrath of those cheap wristbands of gimmick watches I couldn’t get enough of when I was younger (ah, my young naive self). Fortunately, I haven’t noticed my skin reacting negatively to the Rhino Band. It’s made from a substance called fluoroelastomer, which is essentially a synthetic rubber-like material. It’s very similar to the materials you would find in an Apple sports iWatch band. Eventually, it was time for the ultimate test—rock climbing. Even though my wrist was scraping and knocking against the handholds, both watch and band came away completely unscathed. As a guy who’s comfortable shelling out a modest amount of money to protect products I like, I’ve found it difficult to find a solution for housing my Apple Watch more securely. Rhino Band provides a really effective and affordable solution for this obvious issue. The brand offers a decent range of variety for their Stealth model and currently cover both the 38mm and 42mm models. They have 40mm and 44mm models in the works. I felt a little underwhelmed when it came to the variety of colors and patterns. Given how detailed the design was, I would’ve liked to have seen some tasteful contrasting colors on some of the ridges or band details to add some style. This could help curb the “super sporty” look into something that integrates better into an everyday wardrobe. It’s tough in terms of impact but gentle on my sensitive skin. There’s a pleasing balance of protection and comfort. It’s also available in a 38mm style and can be used with the Apple Watch Series 1 through 3 across both sizes. Great value for money considering the quality of materials used. It would be nice to see the aesthetic design points pushed further and more color and style choices offered, but this is just my personal opinion. 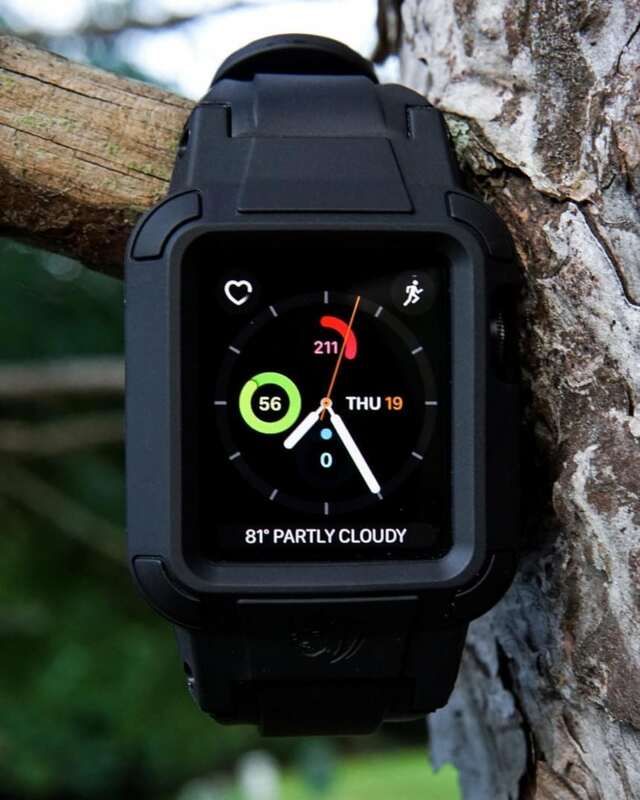 The Rhino Band Stealth is an excellent choice for those who need or want to have their Apple Watch equipped at all times. 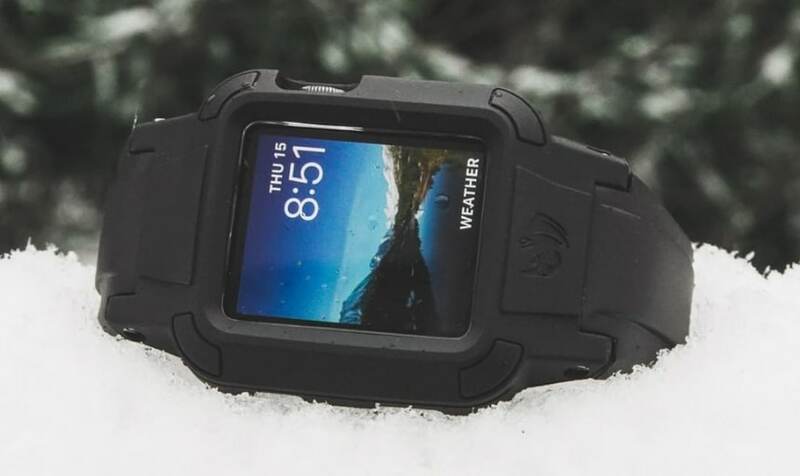 Whether it’s a rainy run to work, a session at the gym, or a hike, you can have confidence that with this beast on your wrist, your tech is going to be safe and sound. Yes, because it aesthetically toes the line between elegant and sporty, I’d love it if there were a few more style choices to allow you to swing that style needle in either direction. But ultimately, aesthetics should be the very last checkbox on your list when buying a protective smartwatch band. 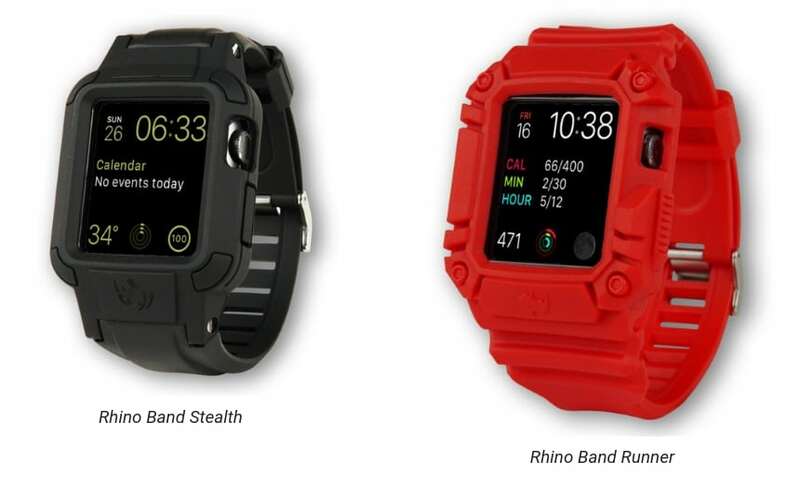 The Rhino Band Stealth currently comes in five colors (for the 42mm version), and in two sizes—38mm and 42mm. I also tried Rhino Band’s heavier duty band, the Runner. Named after an armored military bus, this thing takes rugged to a level that Tom Hardy would be proud of. The band—built from the same advanced polyurethane blend as the Stealth. Notable for its shock absorption, it’s also skin safe and tear resistant. The case—includes a safety secured shockproof vest. The buckle—sturdy stainless steel construction and designed for security. In terms of build quality and materials, there are no real differences between the Stealth and the Runner. The only difference is aesthetic design. The Runner has a more industrial and chunkier look to it. I imagine this adds an additional level of shock-protection, particularly with the additional moldings around the face, as well as the grooves on the strap. 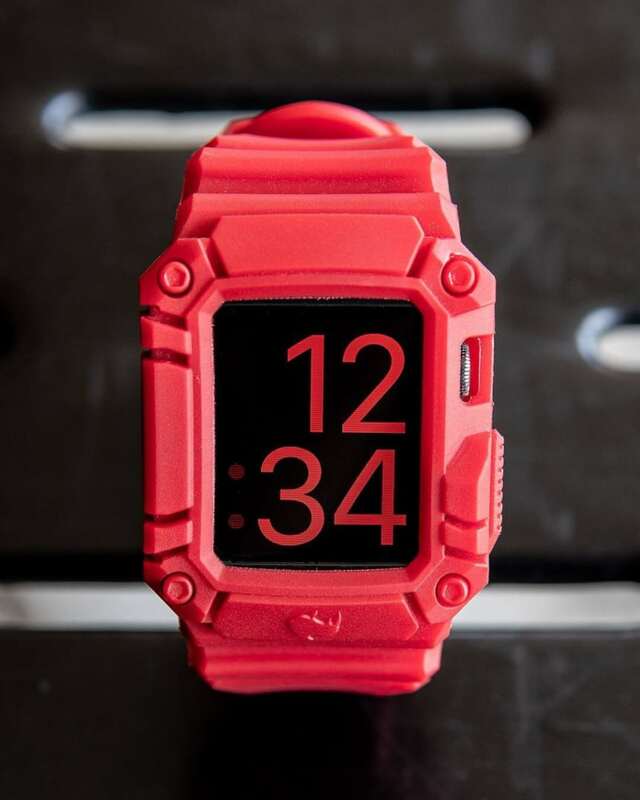 Unlike the Stealth which also has the 38mm model, the Runner will only fit a 42mm Apple Watch. I found the Runner to be just as comfortable as the Stealth on my wrist. Rhino Band has clearly put a lot of time into perfecting the balance between comfort and durability. I appreciate that because the last thing you want to be distracted by is an uncomfortable accessory when you’re performing any activity. In unboxing it, my biggest concern with using this band was being able to easily access the crown and touch function of my watch through the Runner’s bulky design. And I did find this a little more cumbersome than I did with the Stealth. It wasn’t a deal breaker but just something I noticed. I’ve got medium to large sized hands and so your mileage may vary. I wanted to be fair in my testing so I wore the Runner on a climb as well. And again, despite getting the full force of some pretty serious knocks and bumps up and down the rock face, the watch came out in the same shape as it went in. It has a sturdy, high-quality feel to it. The price point is excellent, especially if you consider it to be an insurance policy against any and all damage to your Apple Watch. The Runner’s chunky and industrial style suits the whole activewear vibe really well. Aesthetically, I like that it owns its ruggedness and doesn’t toe the line like the Stealth. The bulky design can make usage of the dials and buttons a little cumbersome at times. You’re limited to only a few, simple solid color choices. I found that simply putting this thing on would give me this strong urge to get outside and do something. But let’s be real. Protection and durability are what you really want with a protective band. And the Runner delivers on both counts. Again, unlike other Apple Watch bands I’ve worn, it’s very comfortable and doesn’t itch or irritate. I look forward to putting The Runner to the test with a few more activities, but for now, it’s easily my go-to activewear band for my Apple Watch. 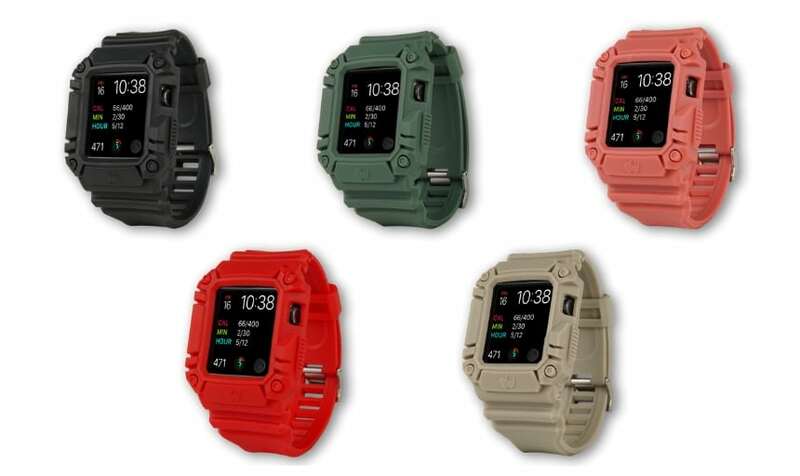 The Rhino Band Runner currently comes in five colors, and only in the 42mm size. The bands are surprisingly easy to install. The watch itself simply pops into the band, and then you strap to your wrist and adjust as you would with any watch. Check out this official Rhino Band instructional video for a clear explanation on how to install. Rhino Band recommends purchasing their protective screen alongside the strap. Since you’re already getting a fully protective strap, this gives you the whole nine yards in terms of both scratch and crack resistance. Once your Rhino Band is delivered, you have thirty days to return or exchange it. Plenty of time to try it on, see how it feels and make sure the color integrates well into your wardrobe. 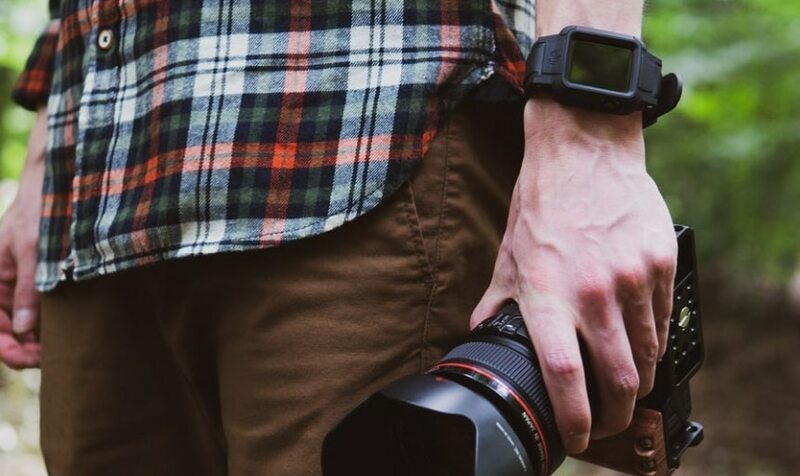 Rhino is currently working on a band for Apple Series 4 watches, as well as a FitBit Versa model. On their current on-offer straps, they’re working on 40mm and 44mm versions. You can subscribe to get an email notification when their new products launch. 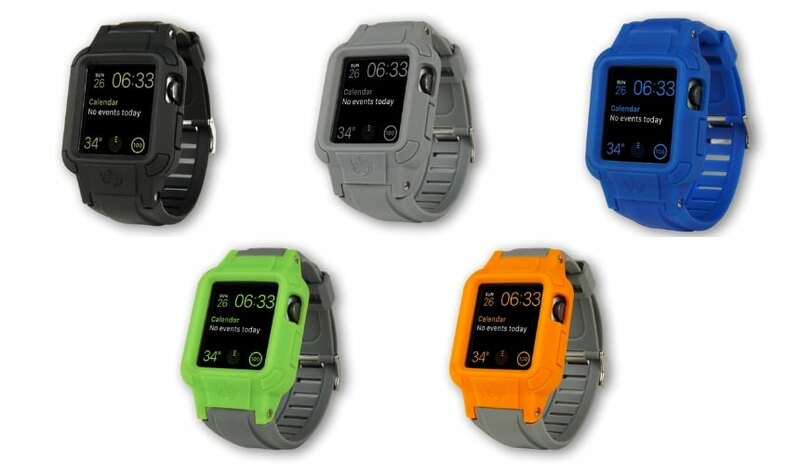 The strap fits easily on either wrist so is therefore suitable for both lefties and righties. Yes, you can easily charge your watch without disassembling it from the band. Rhino Band delivers exactly what they promise. Supreme protection. Times five. In terms of durability, I think you’ll struggle to find a product that offers the same level of heavy-duty shock protection as you’ll get with Rhino Band. They also get a big tick in the comfort box. Your Rhino Band won’t distract you from whatever activity you’re doing. It’ll simply help you use your Apple Watch in a safe way while you’re getting active. Yes, they don’t offer a lot of style choices. But if style is the most important factor for you, then you probably don’t really need a protective band. Whether it’s a phone case or a Rhino Band for your Apple Watch, you should approach it like you would any other kind of insurance. You’re paying a small amount now to protect against the very real risk that you’ll break something later. You’re also paying for the freedom to be able to use your favorite technology, whatever your lifestyle. Given the money you drop on an Apple Watch, it’s a no-brainer. Get your own Rhino Band on the official Rhino Band store, here.